Imagine that somewhere inside of you is a peaceful oasis, a landscape or room customized exactly to your own tastes and filled with a sense of inner calm. Imagine that you carry it everywhere you go, and that you can access it at any time. Imagine that any time you visit you are filled with a deep feeling of love and happiness, a calm contentment and pensive thoughtfulness. Let’s begin with a little chat about meditation and hypnosis. The word “hypnosis” can seem uncomfortable to many, who associate it with circus side-shows of manipulated actions. In the context of my writing, this is not the case at all. The first thing you should know about taking this journey is that you are always in complete control. Your mind will only take you to a place that gives you what you need; you can, at any time, wake up and come out of the trance state. You can also come out of that state for any reason from the external world too - if you hear a knock on your door, or smell dinner burning, or need to get a drink of water, you can slide seamlessly out of trance to attend to your needs, then come back to your sanctuary later when you have the time. You will never be trapped or hurt there. The second thing to understand is that hypnosis, even self-hypnosis, requires a degree of surrender and trust. You have to be able to let your conscious thoughts go and accept the journey your subconscious takes you on, even if it is a bit unexpected. It can be difficult for some to fall into that state of surrender, but the good news is that practice makes it easier and easier. If you’ve never tried hypnosis or meditation, a great place to start is to go through a guided meditation. There are quite a few fantastic options on the web for free - YouTube is a great resource. This hypnosis is particularly powerful in helping to ward off panic attacks, and Michael Sealey’s Channel has a lot of absolutely fantastic videos to relax you in a number of ways. That said, nothing is quite so powerful as creating your own personalized journey to your inner sanctuary, which then can serve as a beginning point for other deeper trance states. Once you decorate your locket and blend your solid perfume, you’ll be ready to start exploring it. This step is, of course, entirely optional. You could just as easily store your solid perfume blend in a little salve container, a plain or decorated locket, a small jar, etc. I just think it’s nice to take a little bit of time to create something beautiful since it will hold such a special tool in your inner sanctuary journey. Mix whatever color of polymer clay you’d like by blending colors together with your fingers and kneading it until it’s soft. If you like a pre-packaged color, just break off a bit and knead it until it is warm and soft. Roll a ball about the size of a small grape or blueberry. If you’re using a smaller locket, you’ll need more like a pea-sized ball. You may need a little trial and error to find the right size. Gently flatten the ball into a disc with your fingers. You want it to be slightly smaller than the front of your locket. Make it as even as possible. 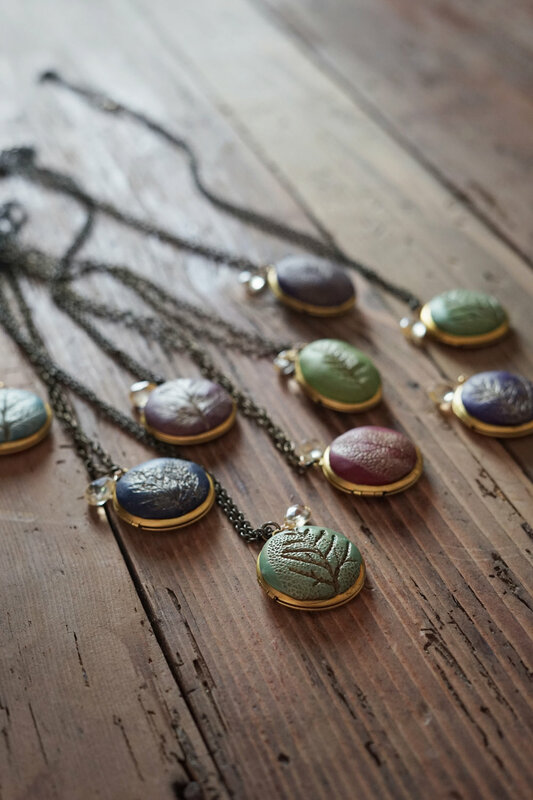 Press the flattened disc of clay onto the front of your locket to match the curve of it. Be gentle; you don’t want to spread the clay out too much or leave deep finger marks. Dip your finger into a tiny bit of cornstarch and use that to smooth out the surface. Cornstarch helps to get rid of fingerprints and other small markings, plus acts as a slight resist for the leaves. Press your leaf of choice into the clay, vein-side down. Gently peel it up to reveal its mark. If you are happy with this print proceed to step 7. If not, you can repeat the process until you are. Bake the clay (still on the locket) according to manufacturer’s instructions. It may take a little less time since the locket will heat up. Let cool completely, then gently push the clay disk to dislodge it from the metal. Glue it in place with a bit of epoxy. Mix some of the gold luster powder with a drop or two of the varnish to make a thin paste, then paint it over the surface of the leaf. Use a bit of slightly damp paper towel to brush off the gold on the raised part of the clay, leaving the gold in the veins. Let dry. Paint with the water-based varnish and let dry completely. Your locket is now ready to fill! *Note: never use oil-based paints or varnishes on polymer clay as they react with the clay and create a sticky mess. Water-based varnish is available at craft stores and most hardware stores as well. Begin by creating your blend of essential oils. I like to do this by sniffing different combinations with their lids open first and seeing which scents harmonize with each other. You may want some coffee beans to sniff every now and then when your nose gets overwhelmed to re-set the system as you do this. You’ll want your scent blend to be particularly relaxing to you, so choose oils that make you feel calm and happy. Lavender, rose, and lemon balm are some of my favorites. Count your oils by drops into a small glass container. You’ll want up to 45 drops total, so keep in mind your balance as you add the oils. Add a little less of each than you think you’ll need; you can always add a couple more later. Pungent scents like clove will probably be used in smaller amounts than floral scents like rose. Once you’re happy with your blend, set the glass of essential oils aside to mellow while you move onto the next step. Set up a double boiler by placing a heat-proof pyrex measuring cup or ceramic bowl in a small saucepan with a couple of inches of water. Heat over medium heat. Pour the oil and the beeswax in the bowl or measuring cup and mix until fully melted. Remove from heat and let sit for 30 seconds to cool down just a little before you add your essential oils blend. Add your essential oils and mix well, then use a metal spoon to carefully pour into the empty locket basin. Let sit until fully solidified, which takes about half an hour. To apply, use your finger to scoop a small amount up and anoint yourself wherever you’d like - on your temples, your wrists, and on your neck are all good places. Infused oils can add a slight hint of color and additional added benefits. To infuse oils, just cover dried plant material with sweet almond oil, then infuse for 4-6 weeks in a dark cabinet, strain, and use. If you’d like to use a shorter method of infusion, set a jar of the plant and oil mixture in a double boiler and heat it on low for a few hours, keeping a close eye on it so you don’t scorch your herbs. Now that you have your decorated locket filled with soothing solid perfume, you are ready to begin your journey to your inner sanctuary and build an association with that particular scent. It’s best to read through these instructions several times first to get a feeling for what you’ll be doing, then dive in. You won’t want to re-visit the instructions while you’re in the process of accessing a trance state. The first time you try this, make sure you are relaxed and comfortable so that you build a positive association with your blended scent. If you’re feeling hurried, stressed, or rushed, save it for another day. In the future, you can access your inner sanctuary even when you’re on a busy bus or in the middle of an airport, but for now you want to keep it as peaceful as possible. I find it helpful to begin by making a list of all the things that are on my mind - tasks that need done, errands to remember, even just things that are stressing me out. Write them down in a quick jotted list and recognize that they’ll still be there when you emerge from your journey, but you don’t need to worry about them for the time being. Find somewhere comfortable to sit or lay down. If you’re feeling tired, you may want to try this sitting up to prevent yourself from just drifting off to sleep. Make sure you’re somewhere that you won’t be interrupted and that you feel comfortable and relaxed. Take a few deep belly breaths to help your body feel centered. Anoint yourself with your perfume blend, placing some on your temples, in the middle of your forehead, and under your nose. One at a time, focus on each of your senses. What do you see? Hear? Feel? Smell? Close your eyes and sink into a feeling of relaxation. Next you’ll do a progressive body scan; that is, you’ll focus on relaxing each area of your body one at a time. Begin with your feet. Notice how they feel, notice any tension, then spend a few moments breathing into that tension and relaxing it. Then move up to your ankles, your calves, your knees, your thighs, etc. Any time you come across an area that feels extra tense, spend a little more time breathing into that tension and releasing it. Move on when it no longer feels tight. At this point, you should be feeling relaxed and heavy, like you’re not sure where your body ends and the world begins. Now you’ll begin your guided imagery. This part takes some focus and you might find other thoughts drifting across your consciousness. That’s okay. Don’t fight the thoughts - just acknowledge that they’re there, and let them drift on by, like clouds up above you. You’re going to begin at the top of some stairs. Picture the stairs in your head: what are they made out of? What is the environment like? Are you barefoot? If so, what do the stairs feel like on the soles of your feet? The more senses you can incorporate here, the better. Begin walking down these stairs slowly. With each step, feel yourself falling deeper and deeper into a state of relaxation and calm. It can be helpful here to count backwards from 10 to 1, knowing that when you reach 1 you’ll be at the bottom of the stairs and be fully and deeply relaxed. Go slowly, remembering to breathe deeply and steadily. Once you’ve reached the bottom of the stairs and are feeling deeply relaxed, picture yourself in a hallway. Once again, describe it to yourself in as much sensory detail as you can. Walk down the hallway until you find the door to your room. This place can be somewhere you’ve been before, or it can be somewhere totally made-up and new. You may be surprised at the place your subconscious takes you. Open the door to your room and take in the sights. What does your room look like? How big is it? Is there any furniture? What is the overall feeling? Is it dark and cozy, perhaps with a lit fire and lots of candles? Or is it bright and open with lots of plants or windows? Survey your surroundings for a little while, feeling a sense of deep gratitude and happiness in your chest. This feels like coming home. Notice that on the other side of your room is another door, this time leading outside. Go take a peek outside that door and view the landscape outside. Perhaps there is a beach with lapping waves, or a forest that extends off into the mountains. Know that this is just one little sliver of a vast internal world you’ll be able to explore. Your room serves as a base for other internal journeys. You can come down here at any time just to relax and feel safe and happy, or you can go out that other door into a whole new world to explore. Out in that world you might find animal guides, archetypes of healers, beautiful landscapes, and so much more. But for now just get settled into this magical room and make it really feel like your own. This is your vision, so you can do whatever you’d like. If you want to conjure up a hammock out of thin air, do so! You can brew yourself a cup of tea, hang meaningful pictures on the walls, or simply just sit somewhere comfortable and look out the window to your own magical sanctuary. While you are there, be sure to envision smelling your special blend in your locket and feeling happy and comfortable. When you’ve spent as much time as you’d like in your room and are ready to come out of the trance state, just walk back into the hallway and down it until you are at the base of your stairs. Know that with every step you take back up that staircase, you’ll be coming gently out of the trance state. As you step up, notice the changes in how you feel and even what you notice - perhaps you start to become slightly aware of the traffic outside your window, or the smell of dinner being cooked nearby. Once you reach the top of the stairs, open your eyes and become present once again. Notice how you feel now. Do you feel more relaxed? Do you feel happy? Breathe into those feelings and smell your locket’s scent once again. Know that you carry this amazing and peaceful place within you wherever you go, no matter what. The more you practice this journey into your subconscious, the more powerful it will become. I have battled excruciating pain by escaping into this place of calm, and you can too. It’s best to practice it when you are feeling good and happy the first few times so you can build an association of ease and pleasantness with your perfume, but once you feel like you are capable of getting to your magical room without too much struggle you can take this journey wherever and whenever you need to. You can eventually reach a point where just smelling your locket will fill you with feelings of peace and tranquility. That right there is the real magic. You can also journey deeper and deeper as you become more acquainted with self-hypnosis. You can ask your subconscious questions while you are in that trance state. For example, one time you might walk out the door and decide that your animal guide will meet you there to accompany you. Your subconscious will provide the animal that you need at that time - though you may be surprised at what comes forth. Don’t fight it, just embrace the journey and trust that you (or a higher power) know what is best for you and is providing you with exactly that. You may encounter lost loved ones, forgotten memories, or places you haven’t been for years while you explore this infinite inner world. And always you can come out of this world whenever you need to, then return later when you have the time.